The What: Nureva has addedActive Zone Control to the Microphone Mist technology platform that powers its HDL300 and Dual HDL300 audio conferencing systems. This feature gives users a new level of control over the thousands of virtual microphones that fill a space and provide full-room audio coverage. The What Else: Using a simple, visual interface in Nureva Room Manager software, IT staff can designate a zone within the room to be optimized for audio pickup. The system reduces the pickup outside the active zone by disabling the virtual microphones in that part of the space. Unlike technologies that attempt to create pickup zones by turning physical microphones or beams on and off, Active Zone Control leverages the unique nature of virtual microphones to provide user control over the size and dimensions of the pickup zone. 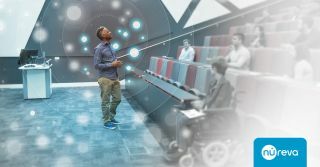 The Bottom Line: Active Zone Control is ideal for any scenario in large spaces where it’s important for audio pickup to be focused on a specific area of a room, such as lecture capture or presentations where audio is being recorded or listened to by remote participants. Presenters can speak and move freely within the active zone without the need for a lapel mic or complex ceiling-mounted solution. Active Zone Control will be shown at ISE 2019 in Stand 11-B180 and at Enterprise Connect at Booth 1732.